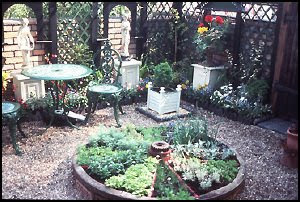 Herb Gardens! I love planning them, planting them, weeding them, and harvesting them. Time spent in an herb garden is time well spent. Where I live now, the barrel method of planting is my garden of choice. My backyard is a small narrow courtyard-type area, and the soil--in the few places there is soil--is poor. I think that with the combination of weed killer and salt used in the past 100 years, it has ruined the soil for everything except weeds. If I plant in a barrel, I have control of what is in it. 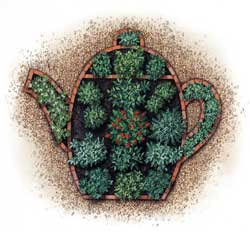 I usually have one barrel for basil...3 or 4 varieties, and a barrel for "general" herbs...sage, thyme, parsley, chives...a "lemon" barrel...verbena, lemongrass, lemon geranium, lemon thyme, lemon mint...lovely tea herbs...and pots of rosemary and lavender. Just thinking about how they smell makes me happy! 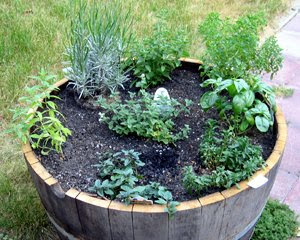 I really wish I could plant a wagon wheel herb garden...so very neat and contained. I want a wagon wheel now, too! I have two whiskey barrels in my landscaping, too - one with seasonal annuals in the front garden, and one that I've let dd#1 plant. Her taste runs more to sweet potato vine and bright orange than I would choose but it's cheery! I enjoy container gardening, too. I often have the container on wheels so I can move it about if needed. Is there anything better than swishing the hand across fragrant herbs to enjoy their scent. Rosemary...don't always like cooking with it, but love having it in the garden.